The most severe charge levied against former New England Patriots tight end Aaron Hernandez on Wednesday in the Attleboro District Courthouse. Though the investigation is still on going, it is clear that Hernandez played a major role in the murder of 27-year-old Odin Lloyd. While a trial will reveal the full extent of his involvement, the events of today have proven one thing football wise: don’t ever go against the Patriots family. 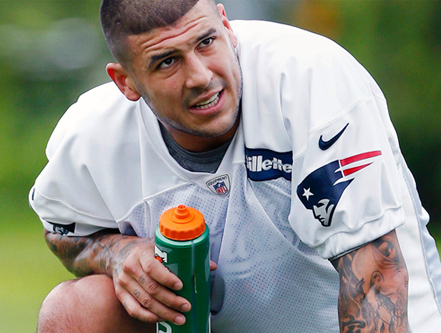 The New England #Patriots have released Aaron Hernandez. While they have since released a more detailed statement in which they extend their condolences to Lloyd’s family, that one Twitter post proved that the Patriots waste no time in cutting ties with people who don’t fit their mold. The organization, whether you like them or not, has been one of the most accomplished and successful sports franchises of the past decade. They are perennial Super Bowl contenders, and from top to bottom the organization is built to win. To me, they are essentially the Corleone family of the NFL, with owner Robert Kraft and head coach Bill Belichick acting as Vito and Michael. They are an organization looking to be the most respected and dominant among all the NFL families, and over the course of the Kraft-Belichick partnership they have seemingly done just that, with five Super Bowl appearances and three Super Bowl wins. And to be the best, you have to instill confidence and discipline in those around you, just as the Patriots have done. Players are an extension and representation of the organization both on and off the field and must carry that responsibility with them at all times. It can be a lot to ask, but success takes sacrifice and hard work. Hernandez not only broke the Patriots’ heart and that of their fans, but he betrayed everything they stood for. He went against the family, and if the Patriots have proven anything over the past decade, it’s that you never go against the family. So while Hernandez awaits trial and for the justice system to run its course, the Patriots will move on with business as usual. As great as the former tight end was for them, don’t expect the team to wallow in self-pity with their heads held low and the Charlie Brown “Oh, Good Grief!” music playing in the background. They’ll retool and move forward, just like they always do. They won’t give Hernandez sympathy or anything at this point. Hell, they won’t even give him a pack of bubblicious gum.